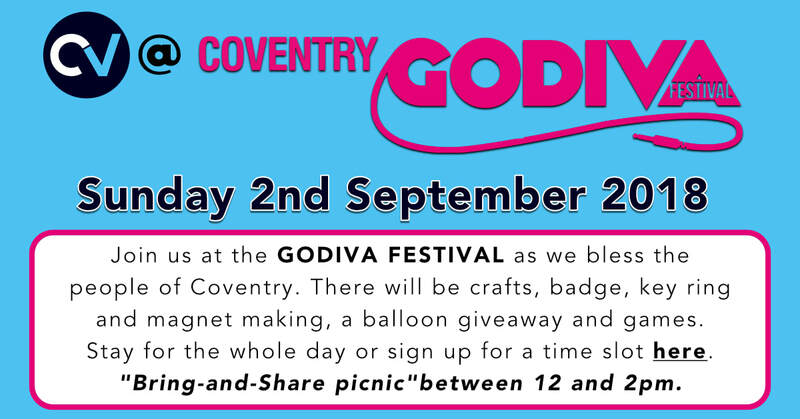 On Sunday 2nd September we are taking Church to Godiva...therefore we won't be meeting at Sidney Stringer but instead we will be meeting at the CV stall at the Godiva festival (located in the Family Field) at 11am. This is a great opportunity for us to be part of an amazing local event and to bless our community, so please along come and help bless the people of Coventry. Come along @ 11am Sunday 2nd September. Turn up at the CV stall with an attitude to serve and bless your neighbours, grab a couple of balloons and a couple of bottles of water and find some smiling Coventarians to give them away to. It’s as simple as that.